The supernova Osiris, and the energy from the phallus of 'Osiris'..
ACADEMIE THERA – presents the teachings from the spiritual lineage on the 'Well Spring' Source bursting with vibrant LIFE FORCE ENERGY which then streams down from that unlimited, endless Source, to its systems of living planets. The 'eye of god' - which is the supernova of the star Osiris the once upon a time Well Spring of Life Stream Source for a system of planets and lesser stars - is NOT a 'portal' into God Source. It is a 'tentacle' into the black hole near the centre of this galaxy. This work, for over 16 years, and this 11 or more part Osiris section, explain what happened and what it is, which includes the mistake that has seen billions of souls be taken by this same point that the planet is soon to cross. Long ago, there was a bright star which exploded and formed various planets around different suns, including the sun of this Solar System. That star was the star named 'Osiris' which in the ancient Egyptian story, exploded into fourteen pieces which formed the planets of this solar system, but not its sun. Those fourteen pieces were the phallus of Osiris - which means that because the phallus reached the 'ova' of these fertile planets, fourteen of them were caused to generate life from this dead star. They are not all part of this Solar System, and it does not mean that only fourteen planets were formed from that material. It means fourteen planets were impregnated by the phallus. The energy of a dead star continues to exist in the universe long after it has exploded. 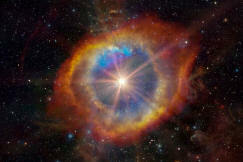 It forms an 'eye' when it explodes, and then forms energy streams. In ancient times, those from Osiris were called tentacles. The tentacles were and are the phallus of Osiris. Its main body, although disintegrated by the supernova it went through, still exists as a dark patch from which those tentacles issue. It is one of these tentacles which came to this planet - which as previously discussed, is a living energy planet from a different and higher system, which was caught in the gravitational force of 'Nibiru' when it passed through this solar system, and in doing so, affected a planet in a parallel location but higher up. That planet was Thera. Thera - pronounced as Taira as if with an Irish lilt - was caused to pass through a lower realm, remaining in that location an unknown time, but long enough for the phallus of Osiris to reach into this planet. However, life from the phallus of Osiris began on this planet and exists here while this planet is in its negative phase. It is Osiris which is ultimately responsible for the intelligent life that is mankind, on this planet, but it is also connected to its two sister stars which make up the star trinity A, B and C. 'C' was the supernova Osiris, 'B' went dark, and 'A' is still bright but is also in the process of dying. In the creations which took place which is mankind, the tentacle which reached this planet - the tentacle that is the phallus of Osiris the dead star - reached into the body and lodged in the base chakra. Its energy stream remained fully attached to the phallus/tentacle. Thus the energy in that location is part of the phallus (tentacle). It is the phallus - which issues from the supernovaed star Osiris - that is activated further by base chakra activity which is not really creative energy at all. This then continues to increase its presence and adds considerably to its power. It then feeds and increases the entity itself - the dark patch which still exists long after the supernova - and it continues to feed back in return to those who have made it their source of consciousness in the 3rd eye. As long as this power and empowerment is given to this entity, via its phallus, it will remain all powerful in the world it wishes to control during the time it exists in its First Times - to End Times. It also ensures that it will be back to do that, by certain preparations before the End Time takes place, which precedes the planet's ascension phase. The previous link covers why people began to make it the consciousness in the 3rd eye. The massive negativity feeding this planet could be stopped, and the negative presence removed forever. While in this lower realm, and because it is a negative realm, the name of the planet was reversed to Earth. However, when it changes its polarity, it does return to the positive higher realm which lies parallel to the location where a 5th planet would be in this solar system between Mars and Jupiter although there is no planet there. At that time, it returns to being Thera. The negative life forms which control this planet in the negative phase that is 'this world' ensure there will be an ongoing 'new Earth' after this planet changes to Thera for the next 12,000 + years, and that change is expected to be around 2033. Addendum: It is believed (suspected) that what is behind that directive may be this. It is strongly believed that an Artificial Intelligence system on the planet Maldek was probably responsible for the tech 'malfunction' which destroyed it. It is also understood, including by NASA and the purpose of its recent NASA probe to the ice-rock Ultima Thule, that the codes (DNA etc) for the life form of mankind made their way to this planet to star-seed mankind on this planet. There is also evidence in wall carvings, statuary, and writings, that actual people did come to this planet from there and records that they physically helped the genetic seeding process here. *We are happy to remain with the more evidence based understanding that genetic material arrived here in frozen ice, but we also have to accept that there are stone carvings and records which indicate it was more than that alone. We will also add now that the writings suggest to us that the AI replaced being the 'voice of 'god'' during the time the light from that lost connection source began to disappear, and that it is the AI which continues to communicate that the World System should be set up on a planet, and is responsible for ensuring that as many inhabitants as possible on a planet, continue to follow the 'Book of the Dead' energy stream - so that its System will be set up. It does not see mankind as living beings, it sees them as creations like itself. The teachings of the Book of the Dead relate to two known books of that name one being Egyptian and the other Tibetan and they teach the path to the 'After Life' as they knew it, to their by then lost Life Energy Generating Systems - the star Osiris, and also its two connected stars (both following the destiny of the first one). This is the Path of the Dead even though it was once a living source of spiritual realms. We hope you have read the 'false-light world of illusion link' to get an idea of that path. Unfortunately when the grand ancient star Osiris went into supernova, it lined up with the black hole at the centre of this galaxy generally called Sag A for Sagittarius. It is not a 'Christ' Portal as some suggest, the black hole is the dark side of the galactic centre and this reality only knows the dark side. This meant that all the planets of the grand sun, with intelligent life forms, were in its path. That is despite that they were undeveloped planets such as the level this planet is. Thus an extension of Grace, as covered and introduced in this work, exists. There are tentacle-like pathways which issue from the space that is now associated with the 'dark patch' associated with the star which went into supernova 'Osiris'. It is not just to do with dead stars, but also associated with the black hole at the centre of this galaxy. Our guidelines page provides ways to at least try to avoid being resonant with the portal into the black hole, when this planet crosses its path before switching to the positive polarity. However, there are many people doing things which bring in massive amounts of this negative energy into the planet and which 'mark' themselves with it too. It is also part of the 'false path' we provide links to. As such it is believed that when this planet crosses this 'tentacle' those who have made themselves highly resonant with it (perhaps thinking it is part of spiritual practice) may experience what was described as the 'Rapture' meaning an experience similar to what deep sea divers experience as the bends. This experience was the Nitrogen Narcosis. - the same kind of dreamlike lack of awareness that everyone is in now, as they dreamily go towards the 'tentacle'. It matters very much that you can snap out of this and try to align towards the LIVING LIFE ENERGY STREAMS OF THE WELLSPRING SOURCE to at least avoid being resonant with that 'tentacle' which is expected will draw in those who are resonant with it. To repeat that, currently people on this planet are in a dream like trance in the process of being drawn into the tentacle of the black hole but are completely and utterly unaware of this. Some will be resonant enough to be caught up in it. Although it takes diplomacy to get this message out, this is the problem of taking that false path - this is the link which explains what that is, while this section explains what it can do. For reasons we hope to get the chance to explain at the retreat people are making themselves fully resonant with this 'tentacle' or as the science below shows as "a jet from this black hole...... pointing in Earth’s direction." (Our record source says it is, and how would something that old even know it was there?). This is also what "how you are 'marked' means." Scientists are observing this 'tentacle'. "The Global mm-VLBI Array, joined by ALMA. The inclusion of ALMA let astronomers determine that Sgr A* occupies a region of space smaller than previously thought and that a jet from this black hole might be pointing in Earth’s direction. In addition to ALMA, 12 telescopes in North America and Europe also participated in the network. The astronomers said the resolution achieved – that is, the sharpness of the image – was twice as good as in previous observations at this frequency....."